Things are a little different here after a wet winter. Gnats. We’ve had gnats since late winter. I asked my brother about that and he shrugged his shoulders and said it was cyclical. “They’re just looking for water,” he said. Terry replied, “Why can’t they look for water outside?” Exactly. Lizards. The lizards are bigger. There’s more vegetation for the insects and more insects for the lizards. 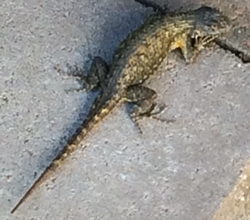 The lizards are an important part of our neighborhood ecosystem. Missing sunflowers. The last two years there were lots of sunflowers from May and on. They bring back pleasant memories of my senior year in high school in 1971. This year sunflowers are late and scarce. But that’s the way it is and that is how it goes.